You can do everything in California in December from surfing on a SoCal beach to snow skiing in the mountains. You can visit Yosemite National Park and Sequoia-Kings Canyon in the winter. 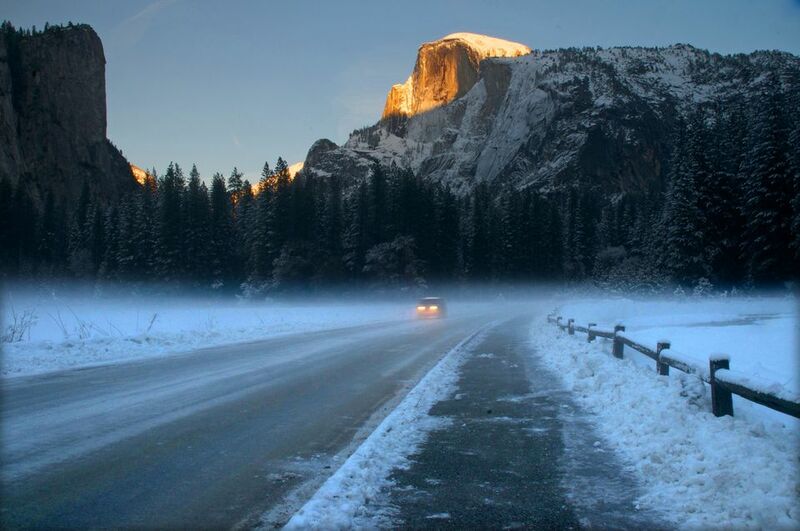 Both parks are open except during snowstorms, but parts of each park will be inaccessible until spring, including Tioga Pass and Glacier Point at Yosemite and the scenic drive into Kings Canyon. The weather in California varies depending on what part of the state you're visiting. In general, coastal areas are comfortable in December, and the desert temperatures are at their most comfortable. In the mountains, you'll find snow, and most of the high mountain passes will be closed. Lake Tahoe will be cold in December with its lows well below freezing at night and barely reaching the 40s during the day. Yosemite Valley will be much warmer, in the 70s during the day and the 50s at night. Higher elevations will be much colder, and there may be snow. Tioga Pass between Yosemite and the Eastern Sierras is always closed by December and it won't re-open until well after the spring thaw. You can get details of the highs and lows around the state in December (and all year round) by consulting these guides to some average highs, lows, and more weather considerations in some popular tourist destinations, such as San Diego, Los Angeles, Disneyland, Death Valley, Palm Springs, San Francisco, Yosemite, and Lake Tahoe. Your packing list will vary depending on where you go and what you're doing. These are a few things to keep in mind. By December, water and air temperatures at the beach limit most people to oceanside strolls. The beach areas are always colder than inland, and they get even chillier when the sun goes down. If you plan to spend time outdoors camping or hiking, pack light layers to stay warm and covered, and in case it's colder than expected, bring a couple of extras. No matter where your plans take you, pack plenty of sunscreen. Even if the sun isn't shining, its UV rays can reflect off water and snow, and you'll still end up with a sunburn. Geminid Meteor Showers: Nature puts on a holiday lights display mid-month. The best places to see them are far away from city lights and where there are few trees: Joshua Tree or Lake Shasta are excellent choices. Whale Watching in December: Gray whales and fin whales are most common. California in the Winter is perfect for skiing and snow play, making it a wonderful place for a winter weekend getaway. Christmas is December's big holiday in California. Use these guides to discover all the things you can do and events you can attend. Christmas in the Rest of California: Train rides, more boat parades, Yosemite's Bracebridge Dinners, and Hearst Castle decked out for the holidays. The end of the month is also the end of the year. Use the guide to New Year's Eve in California to find out about all the big celebrations (and some fun but small ones). Most of the December events in California are related to Christmas or New Year's Eve and are listed in the guides above, but there are a few others. Inns of Distinction Tour, Carmel: An excellent opportunity to visit several of Carmel's most charming little inns and sample local cuisine. Mavericks Invitational Surfing Contest: It's a surfing competition that attracts top surfers, and it can happen anytime between November and March, as soon as the waves are big enough. Most of the high mountain passes are closed in the winter, limiting the number of routes you can take from the coast to California's eastern border. If your trip includes both parts of the state, I-80 west from San Francisco and east-west highways south of Bakersfield are the best options. Typically, you can find the best airfare deals for this time in early October. If you want to visit Death Valley in December, make hotel or campground reservations in September. As long as you pay attention to cancellation policies, there's little risk if you change your mind later. You also need to plan ahead if you want to go to a big, ticketed New Year's Eve party. If you want to go camping at a California state park in December, make your reservations six months ahead of time in June, using these handy tips for doing it right. If you plan to travel anywhere above sea level, you should know the requirements for snow chains. They apply to personal and rented vehicles. If you're planning to camp at Yosemite next December, make your reservations six months ahead of time in June. You can do that online or by phone at 877-444-6777 or 518-885-3639 from outside the U.S. and Canada. Get an overview and more options here.